Here’s a chart from the new book by streets.mn writers David Levinson and Kevin Krizek called “The End of Traffic and the Future of Transport,” all about trends that are changing how we think about transportation. I managed to get my hands on an (appropriately electronic) copy of it, and it’s full of great charts. 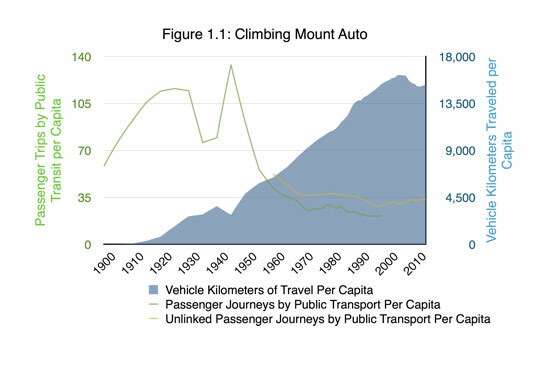 “Many people say the peak is similar to what happened to fixed route transit service in the US (which is now well below one-fifth of its previous importance as described in see Chapter 9). Others claim it is a brief hiatus from the steady march of increasing per capita vehicle travel that followed the same drumbeat almost continuously from 1910 to 2000. Some call the recent patterns of vehicle travel ‘trendlets.’ Many attribute the decline to the pattern to the simultaneous tanking of the US economy; these are the same people who embrace the roaring comeback of total travel in 2014 and 2015, which in terms of total travel (though not per capita) is reaching new heights, due to low unemployment and low gas prices. The book is accessible and wide-ranging, looking at everything from transit to road pricing to self-driving cars to bicycling. Check out the rest here.